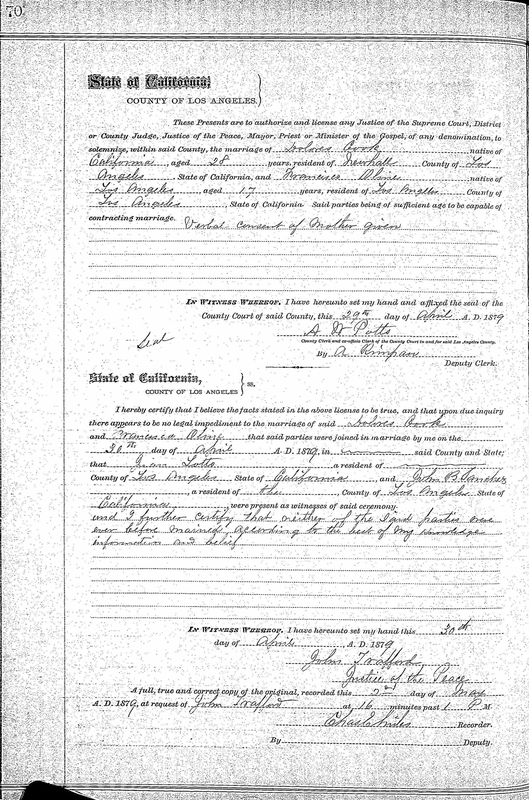 SCVHistory.com | Tataviam Culture | Marriage Certificate: Dolores Cook & Francisca (Francis) Olme, Los Angeles, 4-30-1879. Marriage license (dated 4-29-1879) and certificate (dated 4-30-1879) of Dolores Cook, 28, of Newhall, and Francisca Olme of Los Angeles. Authorized by John Trafford, Justice of the Peace of Los Angeles Township (note: not Soledad Township/Newhall). License states that the bride's mother gave her verbal consent to the marriage because of the bride's age, which is shown as 17. It should be noted, however, that Francisca's subsequent death certificate gives her date of birth as May 10, 1865, which would make her 10 days shy of her 14th birthday when she married Dolores. We don't know which is correct. Certificate states that neither bride nor groom had been previously married, to the best of the justice's knowledge. Witnesses appear to be Juan(?) Lotto(?) and John B. Sanchez, both of Los Angeles County. Dolores Cook (~1851 - Feb. 28, 1890) is a son of William Cook and Trinidad Espinoza. The latter is a California Indian born at Mission San Gabriel (ancestral village unknown). Francisca Olme, aka Francis (May 10, 1865 - March 13, 1931) is a daughter of Antonio Olme, an immigrant either from Belgium or France; and Florida Parker (aka Della Parra), a California Indian born in Los Angeles. Dolores and Francis moved to Castaic in 1882 where they raised a family. One of their sons, Frederick S. Cooke (b. 3-28-1881), married (Chief) Frances Cecelia Garcia, whose ancestors lived in the Santa Clarita Valley prior to European contact in 1769. Dolores was murdered in 1890 by Castaic landowner William Chormicle and his ranch hand Will A. Gardener. Less than three months later, Francis was swindled out of her Castaic property by Dolores' onetime boss (and Chormicle's rival), William W. Jenkins. TLP7901: 9600 dpi jpeg courtesy of Tricia Lemon Putnam.